Most of us think of cleaning our tires each spring as an appearance issue, but in reality, it is an important preventative maintenance step. A common problem is brown tires. This may happen due to caustic degreasers that were used for cleaning or the lack of a tire protectant. Tires have rubber conditioners, antiozonants, and UV absorbers in them to retain the tire’s flexibility. Using the wrong cleaner can cause these important elements to leak out. You are then left with discoloration and cracking. If you don’t care for the tire properly, the rubber can break down. This is known as dry rot. 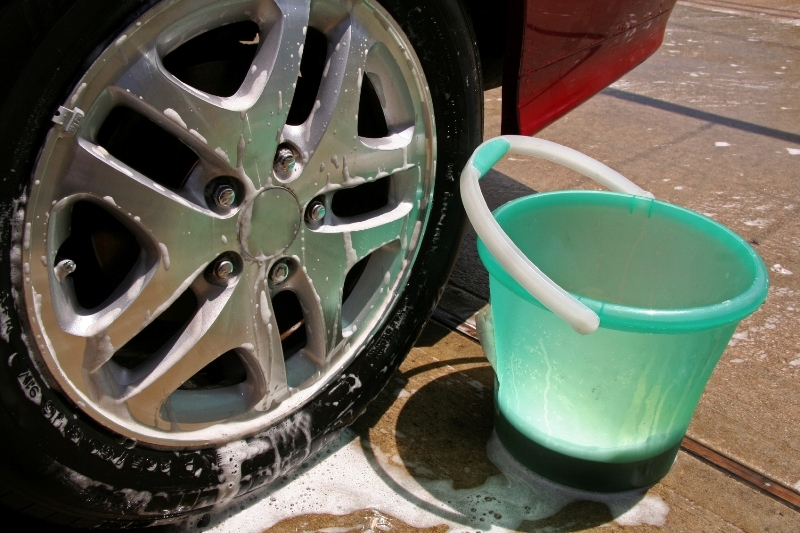 Before washing your vehicle, you will want to clean the tires. By doing them first, you will eliminate grime from splashing onto the already cleaned car panels. Use a separate wash bucket and brush. 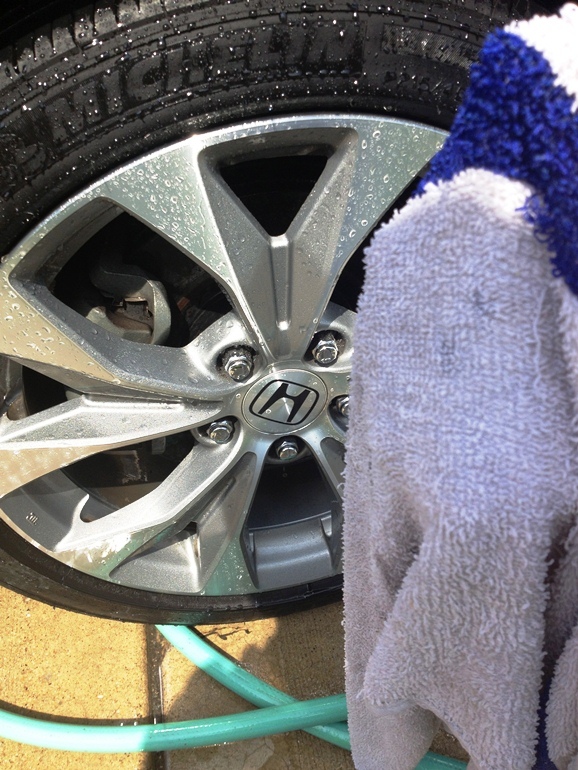 Be sure to select the proper cleaning agent for the type of wheels you have. If you are uncertain as to which cleaner to use, pick one labeled as safe for all wheels and that does not leave a residue or film. Using a product for both the tires and wheels is best. It can loosen brake dust from the tiny holes found in the metal as well as the pores in the rubber. Pick a good brush to scrub with. You’ll find there are many types of tire brushes available. When it comes to the tires, you need a stiff brush. Stiff nylon bristles do a good job of reaching into the nooks and crannies of the tire. Use your brush to scrub the tires thoroughly with your cleaning product. For the best results, always clean the tires one at a time. This keeps cleaning products from drying on. Rinse each one with a strong force of water before continuing to the next one. Once every tire is clean, you will need to dry them. Microfiber detailing towels or terry cloth towels may be used, but keep these towels for use on the wheels and tires only to avoid scratching the vehicle’s body paint. Drying tires and wheels prevents unsightly water spots and gives you an opportunity to get rid of every little bit of brake dust. Now that you have your wheels and tires looking their very best, you need to protect them with the proper products to help retain that like-new look you’ve achieved. The wheels will need a high-quality wax or glaze. These products will keep the surface shining as well as protect against future corrosion. You’ll need a separate product for the tires. An excellent tire protectant is 303® Tire Balm. 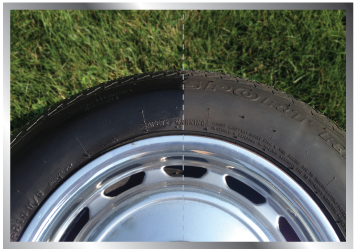 Once applied to the tire, it will leave behind a matte finish without any greasy or oily residue. Not only will it restore the color and luster of the tires, it will provide them with powerful UV blockers that prevent cracking. Additionally, the anti-static properties of 303® Automotive Protectant repels dust, smudges, staining, and soiling. This protectant is easy to apply. You need only spray it on, let stay for about 20 minutes and then simply wipe the excess off the surface dry. Once you have washed and protected your vehicle’s tires you will not only have an attractive looking ride, you will be providing protection that can make your investment in the tires last longer. By avoiding dry rot and cracking, your tires will have a much longer life-span. Using a good product to protect them will keep them flexible and help them retain a like new finish. you. This is actually a greeat site.